Sreehari Nair reviews the Netflix mini-series, Ghoul. 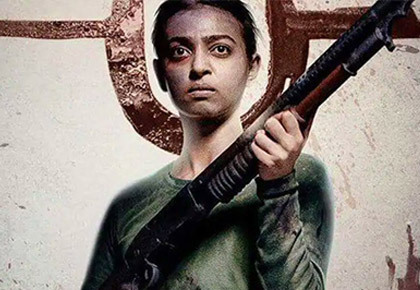 IMAGE: Radhika Apte in Ghoul. Sometime in the mid-2000s, with impossible curiosity beating inside their bodies, executives at Sony Pictures approached Charlie Kaufman to write a horror film. Never one to happily serve the meat-and-potatoes of a genre movie, Kaufman soon found himself making a list of 'real things' that spooked him out. 'Frankly, a guy in a hockey mask didn't seem all that scary,' he was to say later. You wouldn't find a horror movie more removed from the conventions of a horror movie than Charlie Kaufman's Synecdoche, New York. You wouldn't find a horror movie more personal, either. In Synecdoche, New York, Kaufman explored the concept of 'Life as a Horror Film' and talked about things that gave him nightmares at 10 am: The abnormal passing of time, aging, dying, illness, family, regret, loss, and loneliness. No one jumped out of their seats, and there were no reports of terrified noises in movie theatres. But it's fair to say that audiences of Synecdoche, New York were put in close contact with the dreads they were living with everyday. A personal horror film is what Patrick Graham's Ghoul also aspires to be; and the standout parts of this Netflix miniseries are extrapolations of those social trends that its writer-director finds scary on a truly private level. In Ghoul, Graham imagines a future that is dripped in the sauce of his present fears -- a future where the paranoia of our times have been codified into elements of a bureaucracy that now works tirelessly to snuff out free will. There's a huge clampdown on Muslims and on their right to protest -- at the helm of this process is a highly esteemed special force called the National Protection Squad, NPS. Any Muslim who shows even the slightest hint of revolutionary thought is marked as 'infected'. At that point, he is taken to the nearest Detention Centre where a procedure called Reconditioning awaits him. Areas with a high Muslim population have been designated as Scheduled Religion Zones. None of these developments seem government-driven (in fact, you don't even hear a peep from the government for most of Ghoul's three episodes), and almost all of them are outgrowths of public prejudices that have gone on, unchecked. To be an active participant in this social cleansing ritual, there is only one prerequisite: You have to be an undying patriot whose friend and family is his country. Now just try picturing all those souls from your own circle who wake up with this very sentiment knocking at their hearts, every single day. What we have at hand, is an army of people ready to be drafted into the NPS! The scariest aspects of this clampdown run invisible, underground, in Advanced Interrogation Centres, where torture specialists are treated to old Hindi film songs played on a loop -- this is to help them focus better. One of the Advanced Interrogation Centres is code-named Meghdoot 31 (poetically accurate, because outside this centre, rain is a constant phenomenon), which has black windows that leach out its residents' sense of time. 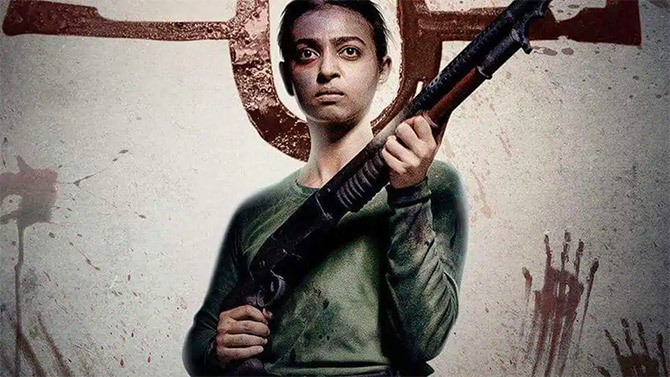 "It may affect your body clock at first," says an officer at Meghdoot 31 to trainee Nida Rahim (Radhika Apte), "but get used to it, you eventually will." What makes this vision of the future so creepy is that it isn't exactly dystopian. On the contrary, all of it looks rather Run-of-the-mill, Organisational and intensely Bureaucratic. Remember how, in Infinite Jest, David Foster Wallace had casually imagined a future where 'Years' are referred to by the name of their corporate sponsors? (There was a Year of the Tucks Medicated Pad; a Year of Dairy Products from the American Heartland, and so on). Ghoul's creepiness, its strangenesses, is of that proportion. The backlashes to the crackdowns in Ghoul are felt in the form of attacks specifically directed at our Babylons of Luxury and Good Life. Posh resorts have turned into safehouses for terrorists -- with hideouts given such names as 'The Sanctuary'. If there's something like a fabled idea of damnation, this is it! Patrick Graham is a googly-eyed artistic prophet and he isn't out to fishhook our attention with grand messages about the reigning 'social evils'. He is talking about good intentions taken to their apocalyptic conclusions. And that even the devil would submit, is genuinely horrifying! Graham, the Brit, has clearly been receiving expressions of a very Indian brand of idealism and patriotism, and in rebroadcasting those without distortions he makes us see the eerily funny side of these fixed ideologies. Patrick Graham's vision is a combination of such Joseph Heller-esque quips, and a visual-aural style derived from the flickering of light bulbs which dominate most frames and from rainfall that looks and sounds a tad 'manufactured'. This is artifice pushed to its spookiest limits. IMAGE: A scene from Ghoul. 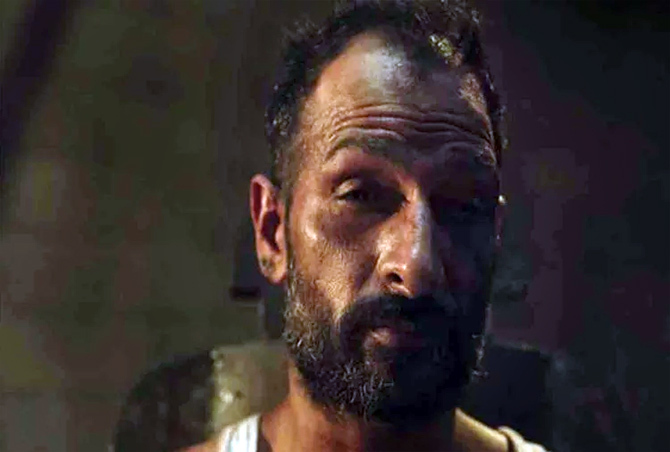 Ghoul, in stretching the present into such absurdities of the future, makes us look at the problem of religion-based persecutions with greater imagination and more empathy than what Anubhav Sinha's Mulk allowed -- which was a movie built on the basic premise that you ought to be a 'Good Muslim' first and then you can gouge out any eye that views you suspiciously. The problem with approaching a subject such as communal hatred (whose waters run deep) through the format of a mainstream film is that you make sweeping statements that affect nobody, and change nothing. The true nobleness of democracy (and this is also what makes it so terrifying) is that democracy lets everyone from the Patriots to the Anti-Nationals have their say. No mainstream film, however well-intentioned, can state something so radical; this is why a series like Ghoul, which at its best can chip away just a small part of your prejudice, is more valuable as a work of art. Is Nida Rahim's father (played by the legendary S M Zaheer) an 'infected man'? Or is he a man merely hanging on to that last thread of freedom that democracy gives him? Ghoul leaves that question open. When children's storybooks are confiscated from Muslim households owing to their supposed power to 'inflame communal tensions', Rahim Senior, a teacher, starts distributing his own revolutionary literature. For Nida, who has conditioned herself to be a 'Patriotic Indian' and who has enrolled in the NPS, her father's act is unacceptable. 'You are teaching that which is out-of-syllabus,' says Nida firmly. She believes he is mad. He knows she is naïve. Soon, she rats on her old man who is then taken away for Reconditioning, and Nida, like good ole' Alice, finds herself winding down a rabbit-hole at Meghdoot 31, where she becomes both the observer and the specimen. Radhika Apte, I am pretty sure, co-writes all her characters. Most importantly, I am positive that she works toward deducing the neuroses of these characters beyond the page (Padman is obviously an exception to this reading). It is Apte's capturing of the core of her characters' confusions, her courage to let their bewilderments work their way freely into scenes, her belief that she may actually be the craziest lady in a room -- that the 'nervous side' of the audience most identifies with. When she is racing, here's an actress who can transform indecision into something appealing, into something that binds us all. 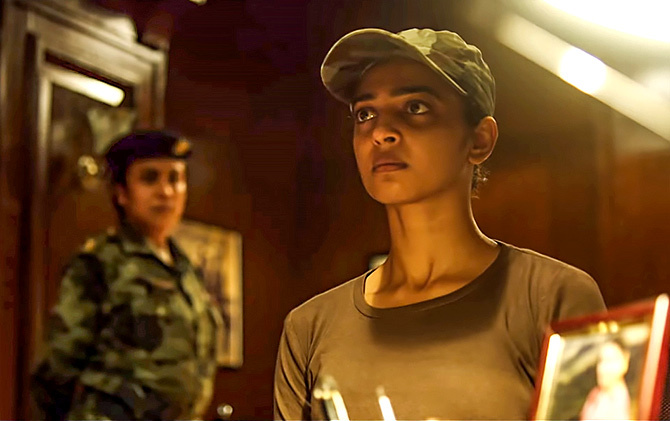 This quality of Radhika Apte, her talent for turning self-doubt into a charm, makes her a wonderful fit for Nida Rahim. Even in a scene in which she is blindfolded, Apte magically communicates to us the calculations that are going on inside Nida. She plays a character whose slightest show of compassion can get interpreted as betrayal, and the brilliance of her act is in her managing to preserve Nida Rahim's humanity even inside this boiling cauldron -- and without once, screaming in self-pity. When a ragged prisoner, detained in the Advanced Interrogation Centre, asks for a quilt, Nida walks toward him to meet his request, but upon realising that she is being scanned by watchful, patriotic eyes, she drops the quilt inside the cell and marches away. As Nida goes through her induction at Meghdoot, the cold, sunless air inside blows on our faces too. The main Interrogation Room, the first time we see it, is being cleaned of piss and blood, with two interrogation officers presiding over it like butchers-in-arms. Though once a temple for the deeply patriotic, the glamour of Meghdoot is on the verge of fading. The officers suffer from hallucinations, but they are told to not discuss this among themselves. Their faces have begun to rot. In a setting where patriotism is a game without any let-ups, the officers have started to distrust one another's loyalty. The hallucinations haven't touched Major Das (Ratnabali Bhattacharjee) yet, but when she says, 'Nightmares relax me', you recognise that her condition might actually be worse than the others. Bhattacharjee plays Das like a rapacious repressed lesbian, and with her sentences tending to gender-neutrality (The Hindi verbs she uses for herself and Nida Rahim are consciously masculine). There are desperations that cross-current and victories so minor that when they are celebrated, you are left wondering about the hopelessness of the whole situation. When one of the two interrogators kills the other and as his body is taken away, the jailed Muslims at Meghdoot step out of their mousiness and laugh maniacally. 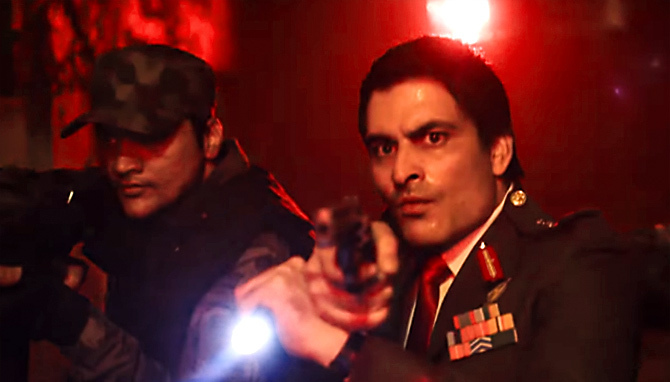 IMAGE: Manav Kaul in Ghoul. When Manav Kaul as Colonel Sunil DaCunha -- celebrated war veteran and leader of operations at Meghdoot 31 -- pours himself a drink and sits at his study table wondering about his broken marriage, the solemn music that accompanies the scene feels like the perfect companion to his state of mind. At this moment, DaCunha is visited by Apte's Nida Rahim and Colonel switches off his player. This is when you realise that the music was nothing more than a background score DaCunha had chosen for himself. Like in the case of movies that use scores terribly, this is a world where you have to pipe in music to know exactly what to feel and when. And the music steps out, just as bureaucracy steps in. Maybe it's because this is a world of heroes who have to spoon-feed themselves that it feels like a world without heroes. When DaCunha explains to a prisoner how espionage had been handed over to him as part of his family's history, when he talks like the Jew Hunter from Inglourious Basterds, DaCunha's junior who watches the performance on CCTV cameras declares that his boss is bluffing. And at one point, we catch Patrick Graham's bluff too. In Ghoul, Graham works up the scares, and then throws in the towel, which towel you discover is decorated with a skull-face -- the oldest and the most juvenile trick in the horror movie playbook. This, like I said, is a world without heroes, and Ghoul starts slipping at the precise instant that its title-hero makes his first appearance. The Ghul or the Djinn, who has a taproot into the vanities of the torture specialists at Meghdoot and who uses his knowledge to deface them, is a good joke, but Patrick Graham exploits it into 50 variations of the same good joke and it stops being funny the second time around. The metaphors of Ghoul which emerge wonderfully from its oppressive setting become overstatements when boxed into a world of paranormal activity and flesh-eating creatures. Patrick Graham knows the dread bubbling up inside him a lot better than the mythology of those fantastical beings, and his personal horror movie becomes languorous when it tries to the deliver the goods of the horror movie genre, straight. The best sections of Ghoul are when it fuses high-comedy with warnings of the Judgment Day that is waiting for us; when it un-self-consciously turns itself into a parody of those terrorism-fighting movies, thus effectively showing us their ugly, unheroic outtakes. A policeman, who stops Nida Rahim's car for checking, is left embarrassed when Nida informs him that she works for the National Protection Squad. To question a patriot is to commit the fundamental error of this age. This is what has become of patriotism in our times -- a single narrative without any branches, a musical chair where if you are caught without a flag, you are out of the game. Ghoul discerns the features of this frenzied patriotism and then shows you how it leads you toward self-destruction, very slowly. There is a clue in that moment for how it will all end for those caught in the flow of this story. But there's something more to that chant. And it's about why democracy -- noble, terrifying, fragile democracy -- despite being kind of an insane idea among a set of practical choices is still an insanity worth fighting for. The death-chant tells us that in a world of sensible generals, fast-talking bureaucrats, and well-meaning citizens, prophecy may still be a talent conferred exclusively upon the insane. Why should patriotic Indians be embarrassed by Mulk?